﻿	USA: Will HUD Benefit Trump? USA: Will HUD Benefit Trump? At the Senate hearings vetting US President-elect Donald Trump’s Cabinet appointees, Sen. Elizabeth Warren questioned proposed Secretary of Housing and Urban Development Dr. Ben Carson over whether he could guarantee that money distributed by HUD will not enrich President-elect Donald Trump. He failed that fundamental ethical test, apparently unable to recognize or avoid conflicts of interest in public service. This report tells how Ben Carson performed under Sen. Warren’s questions. 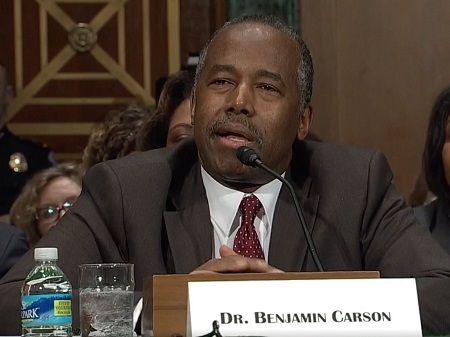 Retired neurosurgeon Ben Carson mostly dodged a question from Sen. Elizabeth Warren during his Thursday confirmation hearing for secretary of housing and urban development, making an unfortunate gaffe along the way. Warren, the Massachusetts Democrat, asked Carson for a simple yes or no on whether he`d be able to ensure the Department of Housing and Urban Development`s grants and loans did not financially benefit President-elect Donald Trump`s businesses. If you are confirmed to lead HUD, you will be responsible for issuing billions of dollars in grants and loans to help develop housing and provide a lot of housing-related services, she said. Now, housing development is an area in which President-elect Trump and his family have significant business interests. Can you assure me that not a single taxpayer dollar that you give out will financially benefit the president-elect or his family? Carson said he would absolutely not play favors for anyone because he is driven by a sense of morals and values. Can you just assure us that not one dollar will go to benefit either the president-elect or his family? she said. It will not be my intention to do anything to benefit any American, Carson said. He quickly realized the gaffe and fixed the answer in his subsequent statement, It`s for all Americans, everything that we do. I will manage things in a way that benefits the American people, he further clarified. That is going to be the goal. But Carson still would not provide a yes or no. If there happens to be an extraordinarily good program that is working for millions of people and it turns out that someone that you`re targeting is going to gain $10 from it, am I going to say, `No, the rest of you Americans can`t have it`? he said. I think logic and common sense probably would be the best way. Warren said that the issue was not assurances of the $10 varieties, but of multimillion-dollar varieties. The reason you can`t assure us of that is because the president-elect is hiding his family`s business interests from you, from me, from the rest of America, she said. And this just highlights the absurdity and the danger of the president-elect`s refusal to put his assets in a true blind trust. Warren said Trump is able to divert taxpayer money into his own pockets without anyone knowing, adding that his Wednesday announcement that he would transfer his assets to his two eldest sons was meaningless. A Trump lawyer laid out the plan for Trump to separate himself from his business, which included relinquishing leadership and management of the Trump Organization to his eldest sons, Donald Trump Jr. and Eric Trump, in addition to another longtime organization employee. Ethics experts voiced their disapproval of that plan, however, which was unveiled during Trump`s Wednesday press conference at Trump Tower. Tragically, the Trump plan to deal with his business conflicts announced today falls short in every respect, Norman Eisen, former special counsel for ethics and government reform in President Barack Obama`s administration, according to The New Yorker`s Ryan Lizza. Photo on front page: Sen. Elizabeth Warren. Photo on this page: Ben Carson. Source: Screenshot/NBC News.